Former Danish defender. Hansen played mainly as right back but also could play as central defender, he was not spectacular player rather very reliable defender who could do great job in covering the space left by other defenders, Johnny was great tackler, good in aerial battles and marking, not too fast and with solid passing range. Emerged from the youth of his home club, Hansen played from 1962 to 1968 for the professional team of Vejle BK in the first Division before moving to Germany for Bundesliga first FC Nuremberg changed. His Bundesliga debut ended on 17 August 1968 (Round 1) with a 1:4 - home defeat against a year earlier ascended Bundesliga newcomer Alemannia Aachen. Again it was Alemannia Aachen at the Hansen should not have a good memory: He scored his first Bundesliga goal - an own goal (for 3-1), the second leg on 11 January 1969 won 4-2 in Aachen. Hansen rose at the end of the season with the reigning German champions in the South Regional League (2nd Division) from - unique to this day. After 34 of 38 second-division games and five goals for the first FC Nuremberg Hansen moved back to the beginning of the season 1970/71 FC Bayern Munich in the Bundesliga and remained there until 1976. For Munich, he played a total of 164 times and posted there his only Bundesliga goals - seven in total. 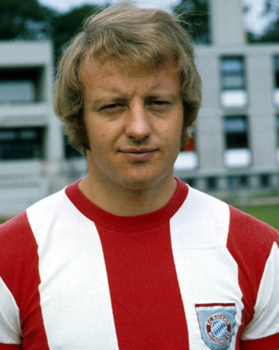 The first succeeded him on 15 August 1970 (Round 1) VfB Stuttgart (final score 1-1). He also came to 27 DFB Cup matches (1 goal) and 39 European Cup games (two own goals - each at home - against FC Dynamo Dresden and Magdeburg first). After eight successful years in Germany, Hansen went back to Denmark. For his former club, he completed three seasons and played on the 5th November 1978 (a 5-1 home win over Køge BK), his last game. Hansen made his debut in the national jersey on 9 June 1965 in Jyväskylä, when he lost the U-21 team in a Test-playing countries with 0-1 against Finland. His last game in the national team he played 10 days later in a 0-0 draw at Skovde in Sweden. For the national team he played 45 international matches, the first time on 26 September 1965 in Oslo in a 2-2 draw against Norway, the last time on 28 June 1978 in Reykjavik in a 0-0 draw against Iceland. His only international goals he scored on 26 October 1966 (3-1 in Copenhagen against Israel), 22 October 1967 (3-0 against Finland in Copenhagen) and 30 January 1977 (4-1 in Banjul against Gambia).